The Yamaha B1DW piano or keyboard bench has an attractive dark walnut finish with a black, leather effect seat cover. Designed to complement the Yamaha range of dark walnut finish Clavinovas, it will make an excellent addition to your room. The B1DW is a fixed height, the standard comfortable height for the Yamaha piano range and measures 47.5 cm from floor to the base of the seat, 52 cm including the seat. The piano bench is 57 cm wide and 32 cm deep. 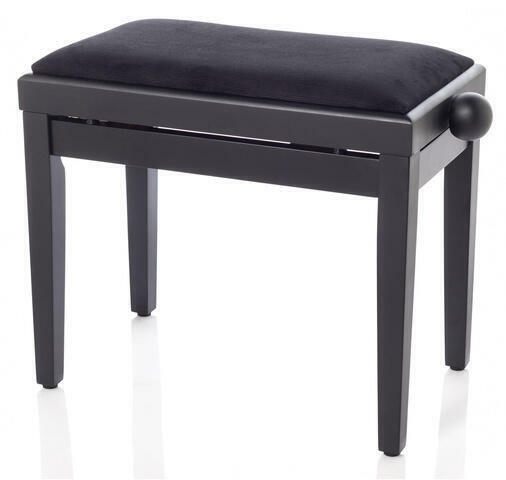 The bolted attachment of the legs to the base ensures the bench will be sturdy and rigid. Some assembly is required, a spanner is provided. Do you own Yamaha B1DW or have you had a chance to try it?